As ostentatious as it is, nothing impresses like gold—whether it’s the 24-carat kind, or the foil covering your favorite block of chocolate. 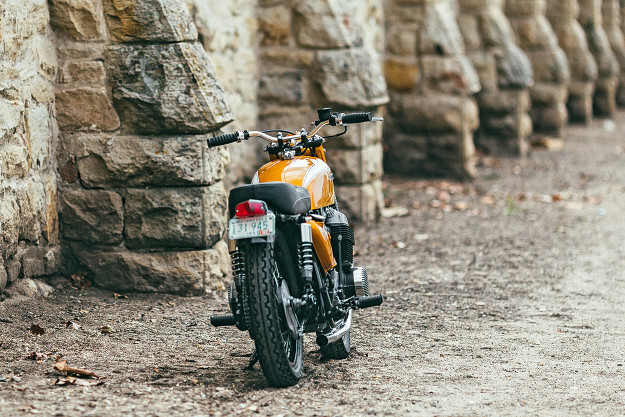 And making an impression is precisely what Brandon Wurtz wanted to do with his first professional build. 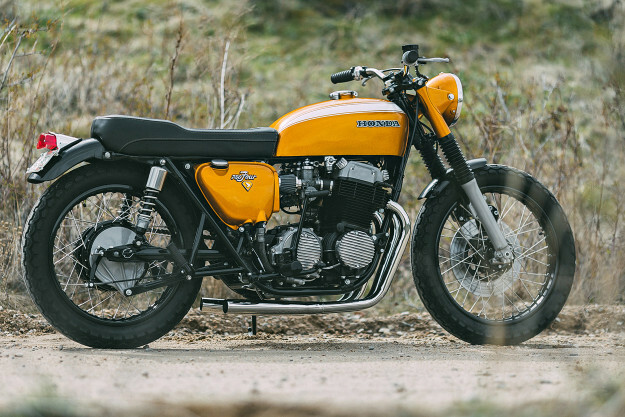 Rather than completely changing Honda’s legendary superbike, Brandon decided to enhance the CB750’s looks and performance by trimming its proportions and lowering its curb weight. 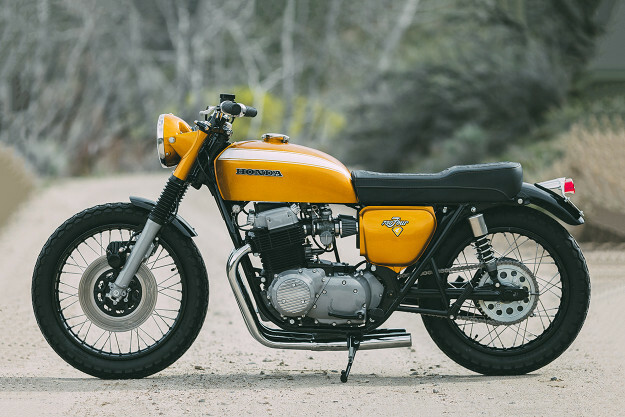 Rebuilding a 45-year-old electrical system is no easy feat, but Brandon has designed and built a simplified wiring harness using Honda’s original color schematic. 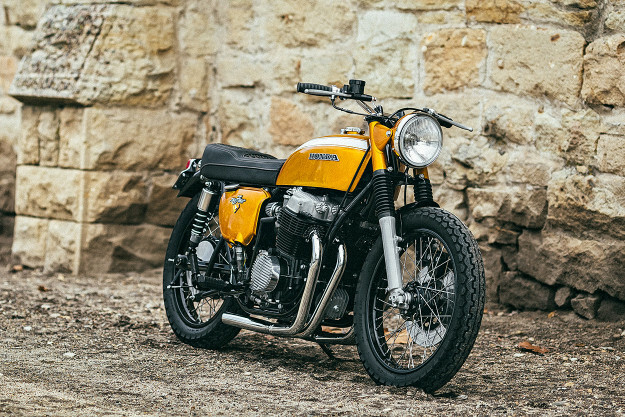 For a clean and consistent spark, he’s combined a Charlie’s Place electronic ignition with powerful Dyna coils. A set of Super Hawk switches controls the accessories. 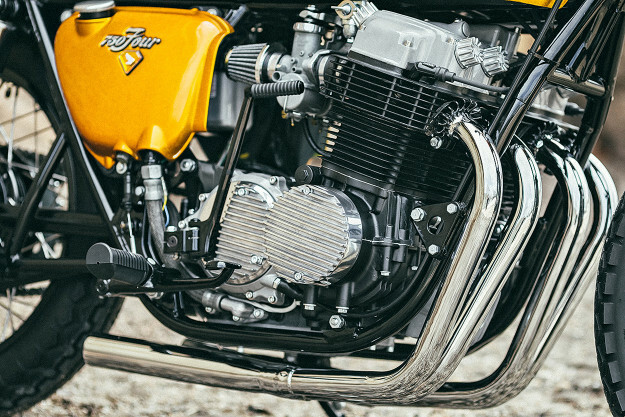 ‘Forking by Frank’ contributed a set of 1.5-inch lower stanchions, and the rear end was dropped to match—using 290mm Hagon shocks to level out the Honda’s stance. 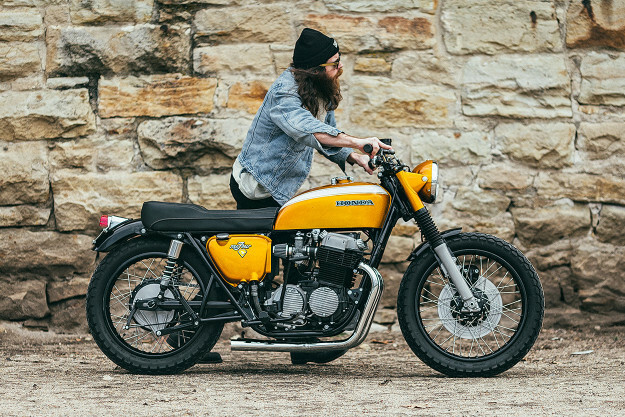 In the quest for minimalist proportions, Brandon has ditched the overinflated 1970s seat. 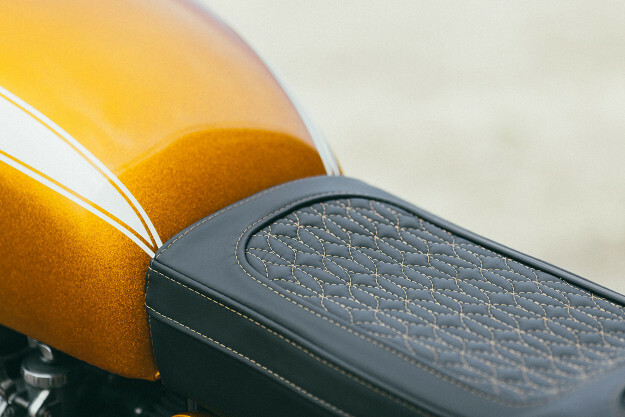 In its place sits a Rawhide Cycles seat pan—covered in gold to match the paint. 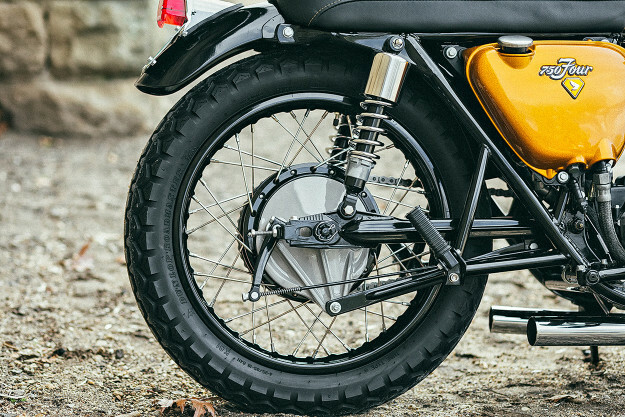 To restore the bike back to its original condition, the swing arm, triple clamps, fenders and frame are finished in gloss black powder. 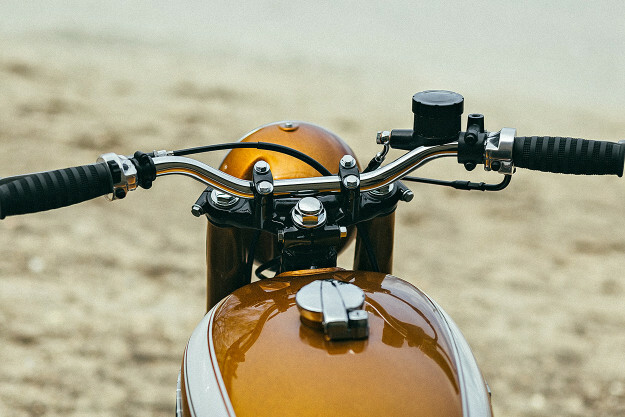 The fork lowers, engine covers, carb bowls, and rear brake plate have been bead blasted to a matte finish, and then sealed in a protective clear coat. 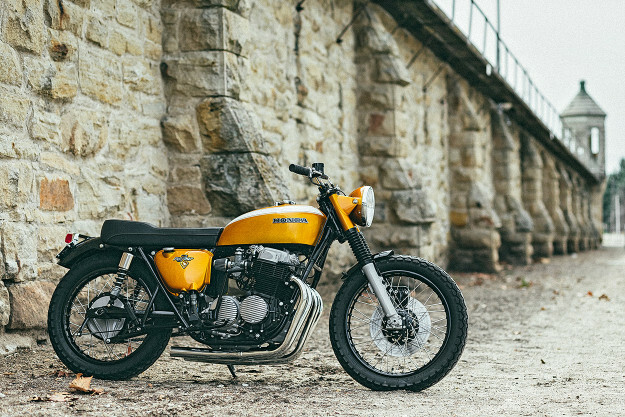 “It is a 100% custom restoration, down to every nut and bolt,” Brandon says. Jack ‘Pacman’ McCann handled the paint, laying down Huffer Micro Gold flake under House of Kolor’s Gold Kandy. 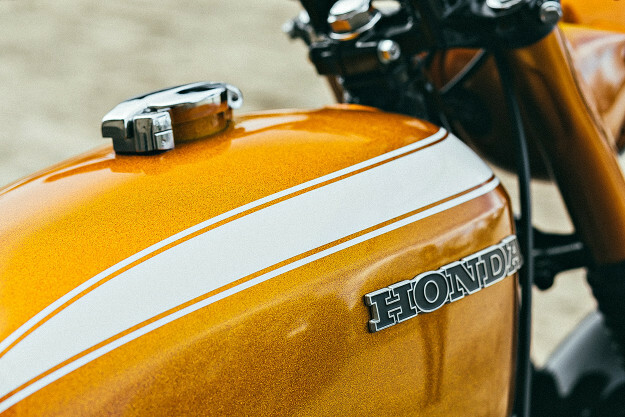 In the original CB750 style, he’s also added PPG white pinstripes, before applying a thick, glassy coat of PPG clear. Looking like a million bucks and running like a Swiss watch, Golden Goose was entered into the Boise Roadster Show in Idaho. 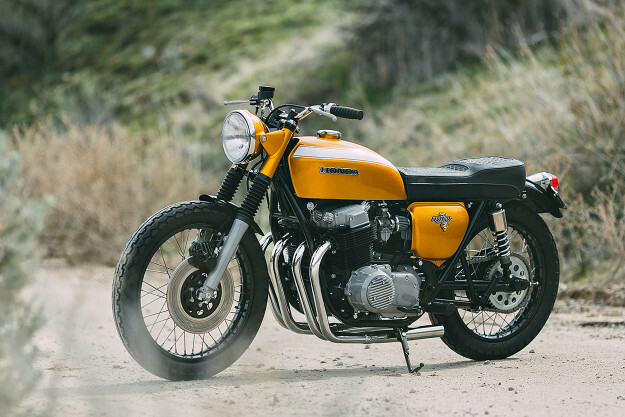 Not surprisingly, the CB750 wowed the judges—and took First Place in the Antique Custom class. Congratulations to Brandon Wurtz for striking gold on his first attempt. We’ll be keeping a very, very close eye on future Rawhide builds.